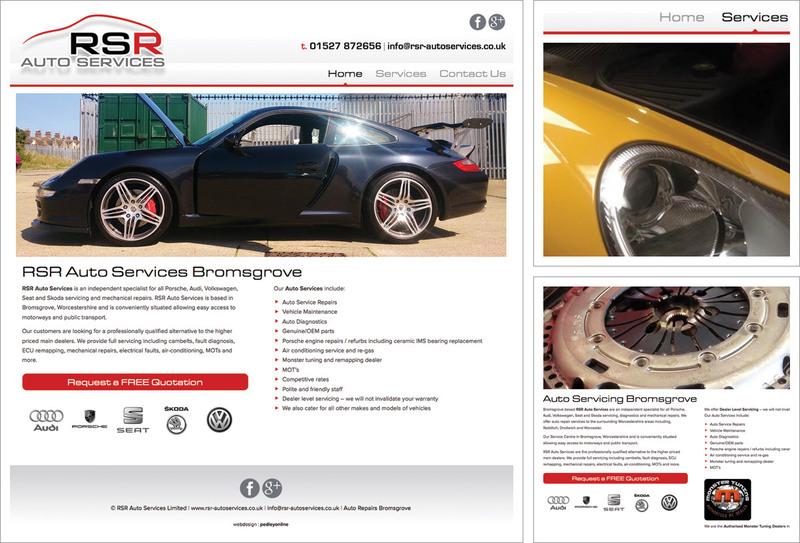 A new website for Bromsgrove based RSR Auto Services who are independent specialists for Porsche, Audi, Volkswagen, Seat and Skoda servicing, diagnostics and mechanical repairs. The RSR Auto Services website features a revised and updated logo, workshop photos in a wide screen changing image banner, manufacturers badges, information about the services they provide and the advantages of using RSR. Each page displays contact details and links to their Facebook and Google+ pages and the Contact Us page has full contact details, a secure online contact form and a location map. Responsive, mobile friendly website design. Basic search engine optimisation for Bromsgrove and the surrounding area for the services on offer and using appropriate keywords and phrases. A small website which is completely expandable if required. Read more about RSR on our web design blog.